The journalist Richard Godwin has described in the Guardian how, in his quest to examine modern manhood, he found groups where men were doing “breathing exercises, talking about their fathers, pretending to be tigers, leaning in on one another, working out which Jungian archetype we vibed with, and trying to articulate why we all felt so defensive and angry and misunderstood so much of the time”. Men were doing these things, were they? Ordinary, off-the-street, pint-in-the-pub-after-work, men..? 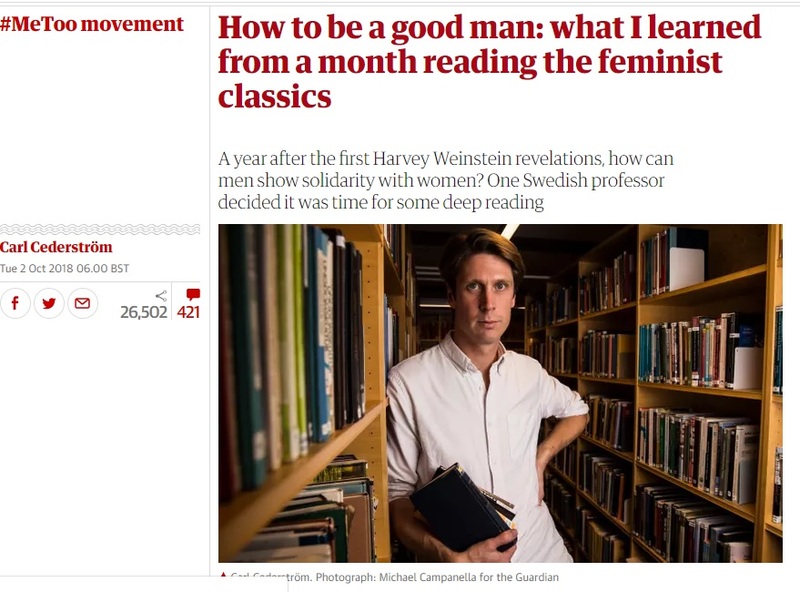 I opted for a quieter approach, following the advice that, to show solidarity with the movement, you could begin by seriously listening to women. Well, that's probably a better start than some men have managed. But did you plan to listen to ordinary women? No. Of course not. They might say things you didn't want to hear. So I decided to spend the month leading up to the first anniversary of the Weinstein revelations reading some feminist classics, which, for inexplicable reasons, I had never got round to. ...the experience of watching the evening news with my wife and eight-year-old daughter as the welter of #MeToo allegations began. The news anchor read out some of the testimonies that had been shared on social media. Usually, when horrible things are reported, we could, as a well-protected family, who previously lived in Wales, now in Sweden, calm my daughter down by saying that these things hardly ever happen in our neighbourhood. But we couldn’t do that now. No, you couldn't. I wonder if you told her why...? Labels: attention-seekers, feminist crackpots, modern society, new men, wtaf? Wife and eight year old daughter? Have pity, the man's hag ridden. "Wife and eight year old daughter?" Maybe if it was an eight year old son, he'd be different?